Submitted by Stratovarius on 2013-07-08 08:58. We're releasing Shadowcasting, from the Tome of Magic! 1 brand new magic system, complete with 1 base class, 5 prestige classes, 60 mysteries, 130 feats, 1 template, 5 monsters, and a few other bits and pieces. Enjoy! P.S. You'll need the new campaign files if you want to play Shadowcaster in the OCs. 3.7.1 brings a little love for the wand wielder in all of us - Master Wand, Wand Mastery (these are two separate feats, thanks WotC! ), Reckless Wand Wielder, Double Wand Wielder, and Wandstrike are all available. Wands must also be equipped to be used. There's also the usual set of bug fixes to compliment the new content. 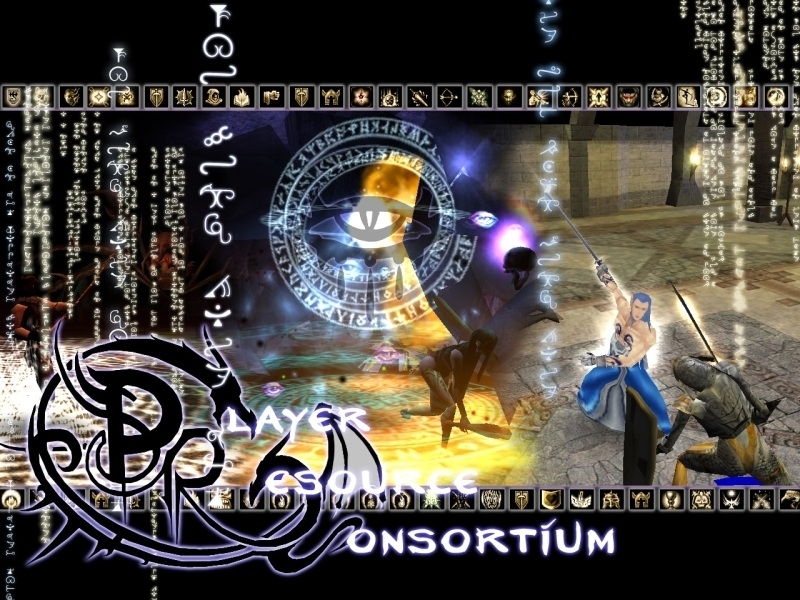 The PRC is the largest ever custom content release for Neverwinter Nights, with over 220 classes, 1500 feats, 1500 spells, 130 races, Psionics, the Tome of Battle, Truenaming, Shadowcasting, Invocations, Templates, Epic Spellcasting, Crafting and so much more, all taken directly from official Dungeons and Dragons material published by Wizards of the Coast. The PRC is fully compatible with NWN EE! 2. 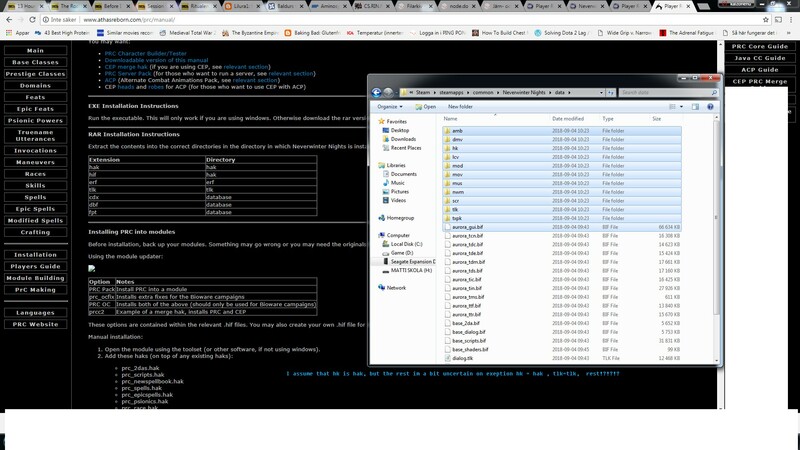 Open Windows Explorer and navigate to "C:\Users\(Username)\Documents\Neverwinter Nights"
4. On the Documents window, navigate to "Steam\steamapps\common\Neverwinter Nights\data\nwm" (if using steam) or "C:\Users\(Username)\Beamdog Library\(Numbers)\data\nwm"
Is it possible to request older 3.2 version link? This 3.5 simply is not working properly with tonyk hancman ai,too many conflicts.. Unfortunately I haven't found v3.2. Maybe someone else has it? But perhaps v3.3G (or one of alpha/beta versions) would be of some use instead? You may try the links that I've just added in the note at the bottom of the description above. just wondering if i could find the following file would it work with the PRC to make class selection simpler and faster then using leto to edit classes? This 2da removes all requirements from prestige classes. Enjoy using a weapon master at level 2! The main point of this 2da is mainly for singleplayer to add a little bit of 'choice' to the game. @Clansunstar: If you will have newer version and need access to editing etc. PM me. Can anyone tell me what kinds of issues prc 3.5 is having with the henchmen ai? If it's not too major I'm willing to bite the bullet and just go for it. ok i got the hax wroking and the player creator working as well. but the creator for some reason dose not have the names or descrtiptions of the races or feats insted to randome jiborush. how do i fix that? The manuals are gone/no longer work? Hello. IIRC there was a PRC Module Updater which allow me to select installing PRC and CEP2 at the same time. The one came from the above download only installs PRC. Where can I find the one which also installs CEP2? Best thing to happen to NWN, is the PRC, its awesome...the words cannot describe. Just the effort involved to make this must have been mind numbing. I love exploring the options, so many. Makes the game infinitely playable now we just need some PRC modules. The modules using this could expand the possibilities of modules to unbelievable depth and height, width and breadth. Stunning really. Can anyone tell me does this makes any changes to base classes? Or does only add base classes among other things? This adds new base classes + prestige classes, new races, new feats, and new spells and more. Speaking of Base Classes, this need something to help players make their own. Please update this for the Enhanced Edition. I probably will as long as they make it able to create custom spellcasters. That is the holdup at the moment. Are new feats/spells/new moves able to handled by AI? (Tony K. AI)? Is AI able to properly understand how to use it? 3.5 has many conflict with Tony K. AI. Some older versions worked with it. Can this be updated to find the EE location ? Bowman: Focus doesn't grant extra attacks. Tempest: Extra attacks from dual-fighting line don't take into account weapon bonuses, therefore making said attack useless against DR.
Spellsword: Channel spell doesn't take into account class-specific spell bonuses like warmage's extra damage or red wizard's extra DC. Enlightened Fist: Arcane Fist doesn't take into account class-specific spell bonuses like warmage's extra damage or red wizard's extra DC. Arcane Duelist: Flurry of Swords - doesn't register kills as yours if last hit inflicted by image. Many Shots: don't take into account weapon bonuses and Arcane Archer's enhant arrows, therefore making shots useless against DR. Pinpoint Accuracy: Same as many shots. * Didn't test it myself but probably all other nonconvinient attacks will have same problems with weapon bonuses. (shadowblade unseen weapon is the first suspect here). Domain, Spells: Doesnt' grant Greater Spell Breach as mention in description. Combat Medic: despite description clearly states it requires ability to cast cure light wounds spell, only divine spellclasses can take this class, but not Bard, who can cast this spell. Attack bonuses: AB in vanilla game are calculated by formula "Base Attack Bonus + Ability Modifier + Capped bonus + Feat Modifier. PRC attack bonuses granted by feats (like insightfull attack) are all fall into capped bonus category unlike vanilla, drastically reducing their effectiveness. **Don't know if bug or not but demilich template gain Automatic Still Spell I, II and IIII but only two levels of Automatic Quicken Spell. Since there are no documentation about templates at all, hard to say is it intentional or not. Edit: Found new bugs, clarify situation with AC- AB bonuses. It will not work with the Enhanced Edition. PRC is only supported with 1.69 at this time. Any chance this will be updated for the new NWN EE released by Beamdog in 2018? @Tazman3002 it'll depend on Beamdog I'm afraid. I'm working on fixing the tools the PRC uses to work with EE. I've fixed the build scripts, I'm nearly done with the Hak Patcher and I've yet to touch the Character Editor (I'm hoping this won't be much more than changing the directory it spits out the character files into). This thread on the Beamdog forums is the place that I'm posting news about it. Unfortunately, the latest stable EE crashes when you load the PRC. I've opened a ticket with Beamdog here. The source code for all my work so far is available on bitbucket. While i would strongly suggest using this mod if you use a non spellcaster pc, i dont think you should use it if you dont. Because while it does add a few cool spells, you cant use any of the spell casting prestige classes without complicating EVERYTHING with dumb menus. Also this mod basically ruins epic spell´s completely. Well I follow the instructions to install this with EE version but with the character creation i have an error when i press "create", it says CHITIN.KEY file missing, if you can help me please. So im having enourmus troubble installing this on the NEVERWINTER NIGHTS ENHANCED EDITION!!!! After looking at the forum match/match post in the installation instructions i can CLEARLY SEE THEY DONT MATCH! See picture for better understanding of what i mean. This is how I assume you are supposed to do it?!?!? After doing it like this it seems i get one of the old bugs ive read about were it work's if I choose a premade character but not if i create a new one then it crashes when i click play and the module start loading (after customize). This currently doesn't work with EE but there seems to be people (look on BD forums) working on it. Doesn't work with the current version of EE. При создании персонажа встречаешь кучу ошибок, которые приходится вручную править. Сначала не видит 2da файла и портреты. Добавлял свой файл и портрет. Когда создаёшь уж чара, то он не рабочий. Инсталлятор не видит ЕЕ. А видит только старую игру. Куда на ЕЕ ставить мод - непонятно. Выложи видео где ты ставишь свой мод и создаёшь чара. Ты потратил кучу времени на создание мода и создание сайта, а инструкции нормальной нет. Для создания персонажа с фичами это мода нужен CharacterCreator, который багует и не создаёт персонажа. А автор этого мода даже не указал тут, что нужен CharacterCreator. This message contained obscene and offensive language and was edited by the moderator. Gonna sound like a silly quesiton, but would anyone happen to know what to do with the "campaigns" zip folder files? The "camaigns" folder contains .nwm files, which are official campaign content. There don't seem to be any instructions, but I'd guess you need to back up your nwm folder before allowing those files to overwrite it. We had install instructions on both Discord and Steam, but not here. The oversight is now corrected. In general, I recommend using Discord for PRC problem solving - the answers come much faster there.